The first time that I heard about the Cisco Champions program, it was back late in November 2015. At that time, I saw the form to submit his application but probably with lack of time and being busy with a lot of projects , deployments and software releases. I didn’t catch the time to present me as a possible candidate. What is the Cisco Champions program? In the below video, you can find already a good definition of what the program is and why I’ve applied to the program. and so see also what can be the problems , the challenges that my peers can experience on a daily basis. On the Cisco Community, here are also some other useful datas that you find about the program. I’m really encouraging you to subscribe to the community in order to find relevant news about all track where you are engaged ! So when the application form came back in November 2016, this time , I jumped on the occasion to register myself as a candidate and so far I didn’t regret it a moment !!! it was planned to receive feedback by mid January 2017 but on the portal , they have announced then that it was pushed until the 1st February 2017 to receive some feedback. So as you have seen above, since the 1st February, all people enrolled into the Cisco Champion program have received the good news via mail. 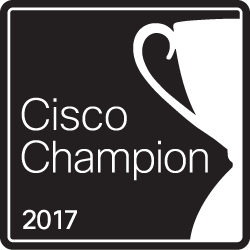 So it is a great honor and I’m very proud to announce you that I will be a Cisco Champion this year. And so far, I didn’t regret my choice!!! A lot of useful information has been already presented on the Community which begins surely to be active and will be a great source of news. It is really a pleasure to be part of this and we can see also this great engagement in all the Spark Champions rooms and this is already a good omen that this year will be a very rewarding year !!! Once again , Congrats and Welcome to all Champions !! !